Going to Havana with kids is not all that difficult, since it can feel like the city is a remarkably family friendly destination. It might lack the obvious draw cards of larger American and European cities, but a trip to the Cuban capital will give your family memories that will last a lifetime. We’ve got a few ideas when it comes to places that your kids are going to love. It’s not as though you can avoid Havana’s Old Town (La Habana Vieja) since it is the geographic and cultural heart of the city. It’s an area where many visitors, adults and children alike, will come to think of as their best-loved spot in all of Havana. 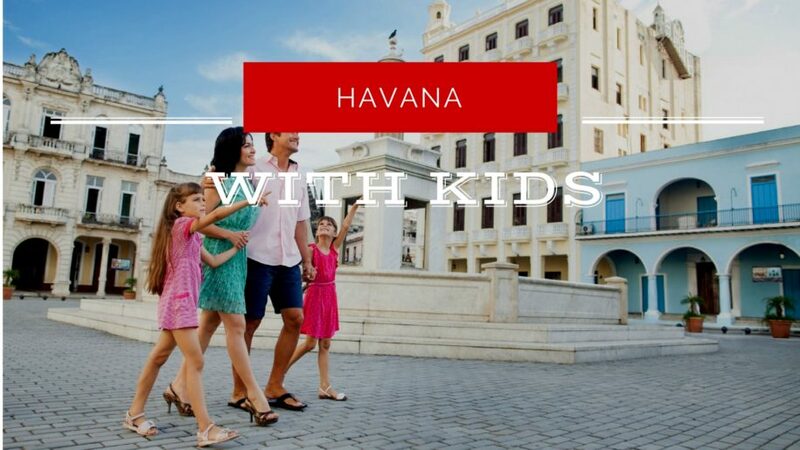 It’s a great option for visiting Havana with kids, since the little ones are going to be utterly fascinated by everything they see. It’s a lot for little legs to manage, so when it comes to walking you might want to just take in a few of the key squares in the district. It’s debateable, but we would suggest that the Plaza de Armas is going to be your best bet when exploring Havana with kids. There’s always a lot going on, and older children will find something they like in the vintage book fair that is permanently situated on the square (and is a great place for you to buy them an inexpensive souvenir). Younger children will probably just be enchanted by the street theater that is daily life in Havana. You can also tell your children about how the Old Town used to be the whole town. Show them the remnants of the city walls and tell them how a cannon used to be fired at 9pm so that everyone could get safely inside the city gates before they were locked for the night. Did you know that Fidel Castro was rather fond of ice cream? You could certainly get the stuff in Cuba before his time, and yet his love for ice cream was so great that he spearheaded the establishment of something that has become a veritable institution in Havana. The Coppelia Ice Cream Parlour is a remarkable experience, even without the actual ice cream. It’s decked out to resemble an old fashioned ice cream shop, although this retro look was cutting edge back in the 1960s when they opened for business. It almost has a suspiciously American look, like the Cubans were trying to perfect the vibe. Your kids will be dazzled by the place, and it’s an excellent way to cool down after a day of exploring the city. Be warned – it can be so popular that they tend to run out of choices on their busy days, so your only option might be vanilla. You could always get around this by opting for an ice cream breakfast! It’s located at 2111 Calle L, La Habana. Havana isn’t famed for its beaches but when you come to Havana with kids, you’ll probably want to take the little ones for a swim. Try Santa María del Mar, which is approximately 12 miles (19 km) from downtown Havana. It’s a popular beach, and can be lively during the daytime, and a bit boisterous after dark when there is often a beach party or two going on (by which point your kids will be safely tucked up in bed). When traveling with a family, it’s better to come here in a taxi than invest the time needed to get here by bus. There’s not a saturation of places seemingly designed especially for children in Havana, but there is something refreshing about this, like kids are included in daily life to the point that they don’t need ostentatious, overpriced amusements. They will get a kick out of the simple charms of Parque Cespedes, which is a low key amusement area designed with kids in mind. There’s a small fee to enjoy some of the rides, but it’s a remarkably relaxed affair. You can sit down and take a break while your children gently whirl past on the merry-go-round. There’s something beautifully old fashioned about this place, and it’s in an unbeatable location (on the Malecon, close to the Museo de la Revolucion). Some kids might furiously resist your efforts to culturally enrich them by taking them to art galleries, but when coming to Havana with kids, you have a major advantage. Take the short trip to Jaimanitas, a cute fishing village on the edge of Havana. When the artist José Fuster made his home here in the 1970s, he started to decorate his home and studio with a succession of garish, wonderfully childlike pieces of art. These murals and sculptures gave his home a distinctive look, and when his neighbors asked if he could do the same for their homes, he didn’t hesitate… or really stop. There are whole streets in this area (now known as Fusterlandia) decorated in this style like a drawing has come to life. Your kids will walk around with their jaws on the floor, experiencing art without having to set foot inside a gallery.